LOS ANGELES — Moritz Wagner drove for a layup to put the Los Angeles Lakers up by 31 points, and his teammates erupted off the bench in spontaneous glee for their German rookie’s first NBA field goal. Kyle Kuzma scored 23 points and James had 22 before both sat out the fourth quarter of the Lakers’ third home victory in four days, 120-96 over the struggling Suns on Sunday. Brandon Ingram scored 15 points and JaVale McGee had 14 points and eight rebounds in three quarters of work for the Lakers, who have won 12 of 16 since their 2-5 start to James’ first season on the West Coast. No. 1 overall pick Deandre Ayton had 10 points and 10 rebounds, but the Suns couldn’t build on their excellent first quarter. Suns: T.J. Warren missed his second straight game with ankle soreness, but Kokoskov doesn’t think it’s serious. Jackson started for the second straight game in Warren’s place. … Ariza, who spent two seasons with the Lakers from 2007-09, attended Westchester High School near the Lakers’ training complex before going to UCLA. He got a warm ovation from Lakers fans, many of whom would love to land his services as a 3-point shooting specialist for their team. Booker missed three games in October after straining his left hamstring in the Suns’ first game against the Lakers. 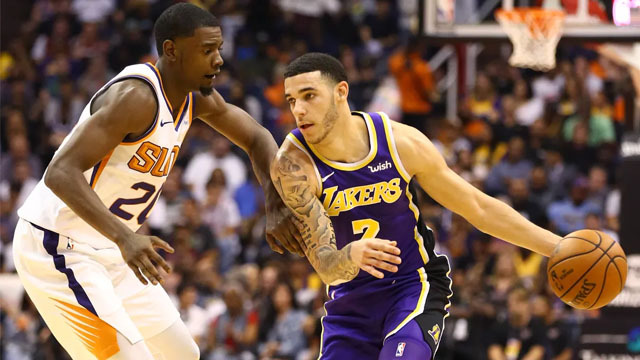 He was returning Sunday from a one-game absence due to an injured left toe after stubbing it on his hotel bed during the Suns’ trip to Los Angeles to play the Clippers last Wednesday. Kokoskov had no immediate update on Booker’s condition afterward. Wagner scored the first 10 points of his NBA career in the fourth quarter of his fourth game for the Lakers. The first-round pick from Michigan and Berlin hit two free throws before getting his first field goal with 5:01 to play. He added a pair of 3-pointers a few moments later. The start of the 6-foot-11 Wagner’s rookie season was slowed by a bruised knee in training camp. The Lakers didn’t adapt well to the early start time, falling behind 25-8 in the opening seven minutes with a turnover-plagued beginning. But Kuzma and James sparked an abrupt turnaround late in the first quarter, and the Lakers made a prolonged 45-18 run to a 15-point lead late in the second.